3/4 length harem capris are the perfect wardrobe staple for spring and summer. This item is made-to-order and is for babies and toddlers. 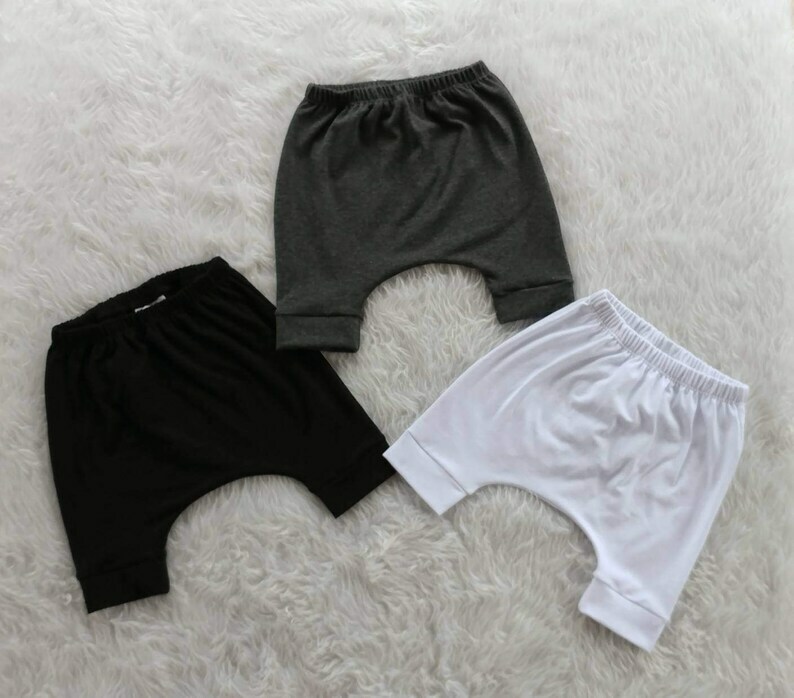 This listing is for unisex 3/4 length drop crotch pants with cuffs for babies and toddlers. These hipster pants have an elastic waist for a custom fit. 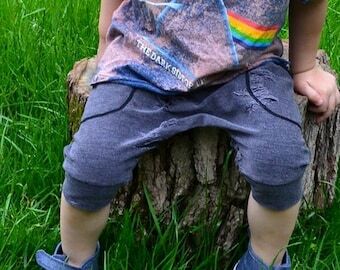 The fit of these pants is baggy with plenty of room for cloth diapers and the legs hit below the knee but do not reach the ankle. These baby and toddler joggers keep your baby comfortable while looking stylish. Drop crotch pants are trendy, unisex, and the baggy look goes with many different styles of tops - bonus that the loose-fit crotch gives your child room to grow! When purchasing, you are buying ONE pair unless you select a quantity greater than 1 (one). Thumbnail pictured displays some of our available colors. These pants have a looser fit in the leg. Our stretchy knit pants are made with a quality, medium-weight, super soft cotton/lycra blend fabric for optimal stretch and comfort. Each and every pair are made with attention to detail and they are made to last, whether your little one is crawling at home or tumbling at the playground. All seams are professionally finished with a serged edge to prevent curling or fraying and with the comfort of your baby in mind. All hems are finished professionally with a coverstitch to give our handmade garments durability and stretch. Be sure to check our size chart in the photos to ensure you get the best fit. If you need help measuring your child to determine which size will fit best, please send me a message and I will gladly assist you. 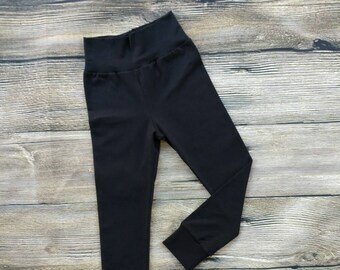 Custom sizing is also available – if you need more length in the leg or your child’s measurements require mixed sizing let me know and I will do my best to accommodate you. Sizes available: Newborn, 3 months, 6 months, 12 months, 18 months, 2T, 3T, 4T, 5T and 6T. Machine wash cold on gentle cycle with similar colors. Machine dry low or no heat. All items are made-to-order and currently ship within 3-5 WEEKS. Our production times are subject to change based on the number of orders in our queue and listings will be updated to reflect the most accurate production times. We currently offer shipping via USPS and only to US buyers for the time being. Standard shipping is First Class 3-7 business days. You may choose to upgrade your shipping for an additional fee to Priority Mail 2-day. Please review our shop FAQ for shipping and other policies. Items will be folded neatly, delicately wrapped in white tissue paper, and tied with three strands of 1/8" ribbon into a bow. So cute and high quality. 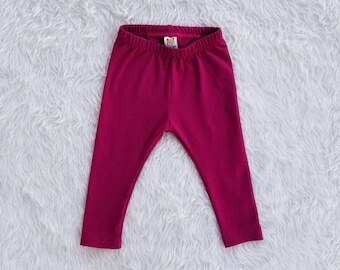 Sweet and soft baby yoga pants. Shop owner went above and beyond for me when she was unable to deliver her product by promised date, she actually credited me the cost and shipped me the pants. Wow, in this day and age, an honest shop owner with integrity! 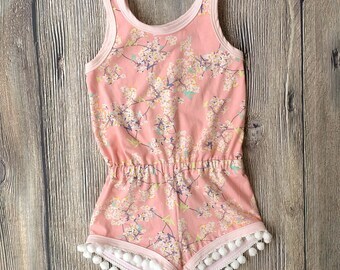 This onesie is super cute - I love the sparkly gold. It did take a while to ship, but they warn you of that when you order, so it’s no big deal. Thank you! You can request custom sizing such as additional length in the leg of pants or the hem of a shirt. You can also request personalization of our designs (adding/changing names or words). Unfortunately, we are no longer able to offer custom handmade items and/or design work off our listings menu due to our queue size and production schedule. If and when we are able to offer this again, we will update here. We apologize for the inconvenience! Made-to-order items are considered custom items. Custom items are not eligible for returns or exchanges. Adjustments to orders (mixed sizing, adjusting length/width, etc) or personalizations/customizations of existing designs will not be made until purchases are complete. TO CARE FOR ITEMS WITH GRAPHIC DESIGNS: Wash the item inside out, either on a delicate/hand-wash cycle and dry low/no heat OR by hand and line dry/hang to dry. Do not iron over the design or use bleach. If the item is wrinkled and you need to use an iron, iron using the lower heat settings, avoiding your graphic design. Doing so will irreparably damage your item! TO CARE FOR YOUR HANDMADE CLOTHING: Care instructions vary based on the fabric content of the clothing purchased. Each item will come with an attached hang tag containing care instructions for you to reference. Sizing varies based on which clothing item you choose. Many of our items have sizing charts available with measurements that can be used to determine which size will fit best fit your child. These charts are included in the listing photos for your reference. If you need help taking measurements or have any questions, I'm happy to assist you - feel free to message me and I'll do what I can. Custom and mixed sizing is available upon request at no extra charge. MADE-TO-ORDER/CUSTOM: Made-to-order items are custom items and as such, cannot be returned or exchanged. Please review the product sizing chart in listing photos before buying. READY-TO-SHIP: If you wish to return or exchange your READY-TO-SHIP item, please contact us within 2 business days of delivery to you. Items must be shipped back to us within 5 business days from the date you contact us. Used, washed, worn or damaged items not in original condition do not qualify for return or exchange. Please read product description to determine whether an item is made-to-order or ready-to-ship before purchasing. Return shipping costs are at the buyer's expense; refunds are issued upon inspection of the item(s), less original shipping costs. Due to the nature of producing made-to-order clothing, once we have set aside materials and started working on your order we are unable to cancel. We understand that sometimes people change their minds, and as long as we haven't started on your item you may cancel for a full refund. Work can begin quickly to prepare your order once it is placed. Because of this, the policy is set to cancellations being available within 6 hours of your purchase but if that period of time has lapsed and you would still like to cancel, please message me. If your order has not been started, I will gladly cancel and refund your order immediately. Ready-to-ship items may be canceled at any time up until they are shipped. If you have purchased a ready-to-ship item and wish to cancel your order, message me at any time. If the item has shipped, we must wait until you receive your purchase. Once the item is in your possession, you may choose to keep your purchase or you may return it for a refund. If you would like to return your item for a refund it must be returned in original, unused, unwashed, unworn and undamaged condition and shipped back within 5 business days. A refund will be issued upon return inspection of your purchase, less original shipping costs. Return shipping costs are the buyer's responsibility. I ship via USPS. Standard shipping is First Class with delivery within 3-7 days. You can upgrade to Priority or Priority Express. Once an item has been shipped, I am not responsible for or in control of what happens with it; this includes: delayed, damaged, misdelivered, lost or stolen packages. If you need help contacting USPS about a delayed, lost, misdelivered, stolen or damaged package, please let me know. If a package is missing or stolen, to process your refund or replace your order a claim must be filed with USPS. Additionally, in the case of a stolen package, a police report must be filed with your local law enforcement. SALES TAX: California residents will be charged 7.5% tax on the cost of shipping as per CA law. All orders are fulfilled in the order in which they are received. This means that sometimes your order may have to wait to be filled until other orders ahead of yours are completed. If you need your order by a specific date or more quickly than normal, please message me BEFORE placing your order so that I can give you the best estimate of when your order would be shipped based on my queue of current orders. I offer a rush service if the need arises. This re-prioritizes your order so that it is next to be completed. There is a non-refundable rush fee involved to bump your order to the front of the queue. We are proudly CPSC compliant. We take all requirements and safety regulations very seriously and believe that compliance is of the utmost importance. 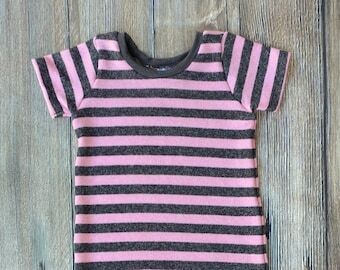 At Tiny Fox Threads we happily put the time, energy and research into making sure the items we create and sell are safe for your children and that they meet safety, lead and flammability requirements. We will never use unsafe or questionable materials when making products for your children. We now happily offer international shipping options! Shipping times may vary based on your location and the method chosen at checkout. If you need help with tracking your order or have any questions about the details of a shipping method, please feel free to message me. I'm happy to help! VAT / JSC / GSC / TAXES & FEES: Some governments charge a tax on imported goods that is not applied to your total when you purchase from me, and instead is applied once your package arrives to your country through customs. I am unable to predict whether or not your order will incur an import tax, nor am I legally able to pay it for you. I am unable to mark a purchased item improperly to avoid these fees. Yes! Unless otherwise noted, all fabrics are washed prior to being used for your handmade order. This is done to ensure your clothing is free from dirt, dust, chemicals or fragrances that may be left behind from the fabric production process. Prewashing also minimizes the risk of dye running and staining other clothing as well as minimizing shrinkage when you wash it at home. Our fabrics are washed with a hypoallergenic, fragrance-free, phosphate-free, dye-free, formaldehyde-free, dioxane-free detergent. If you would like an ingredient list for our detergent to ensure that there will be no issues with allergies for your child, message me and I will promptly send it over.